If you’ve read my last couple of posts, you know that we were in Chicago and surrounding areas over Labor Day weekend. You’ll also know that at times, we had trouble finding food options for Nikki. If you have dietary restrictions, you know it can be difficult to find food in a new city. Add in not having a vehicle, hopping between events, and traveling with others (our friends were great and are always understanding & accommodating), it can frustrating. We generally avoid fast food, but found some healthier options. Uber Eats was a lifesaver on several occasions (this is not an ad, it’s what we found that was helpful). Luckily, they had options in our delivery area that had options for Nikki. Hooray! On the second night, we settled on American WildBurger. They have a variety of burgers, including beef, turkey, and even kale. Their WildBurger is a combo of beef, turkey, and chicken burgers. I don’t know if I’m adventurous enough to try that! American Wildburger offers gluten-free chicken tenders, naked chicken wings, and buns. 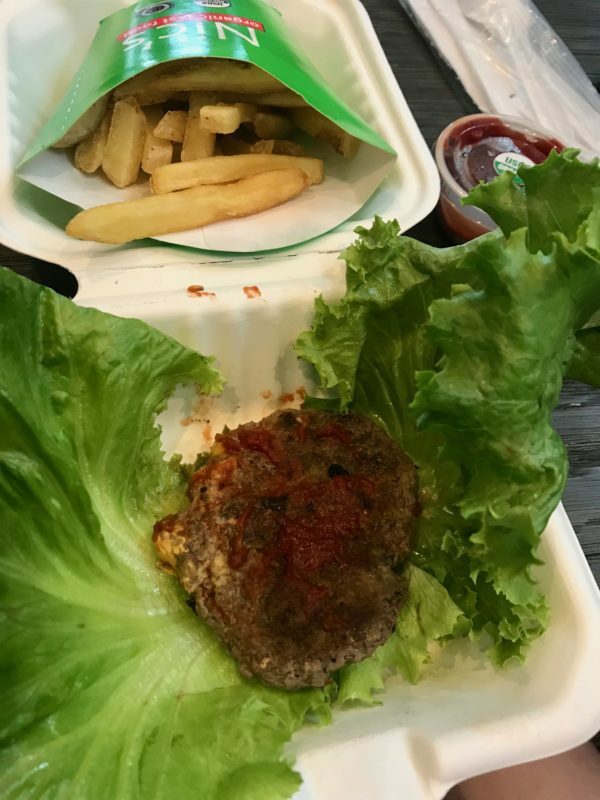 Nikki settled on a beef burger with a gluten-free buns. I called the restaurant to find out if the buns were also soy- and dairy-free. Fortunately, they were. Unfortunately, they had just used their last one, but would get more the next morning. Nikki decided to go with the lettuce bun. 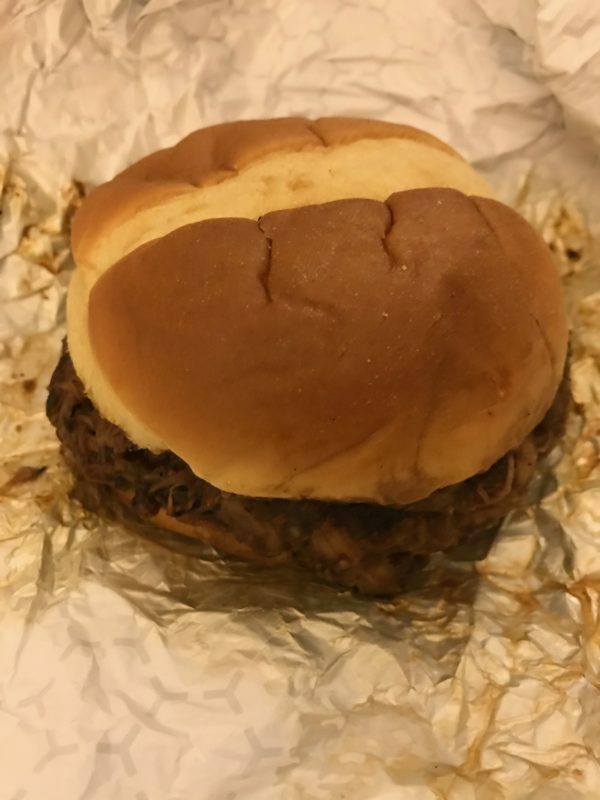 The pulled pork sandwich caught my eye, but I had never had BBQ outside of the South. I decided to go for it & it was a good decision. We both had fries, which were gluten- and soy-free. There’s a beef patty in there, I swear. See, I told you there was a beef patty in there. 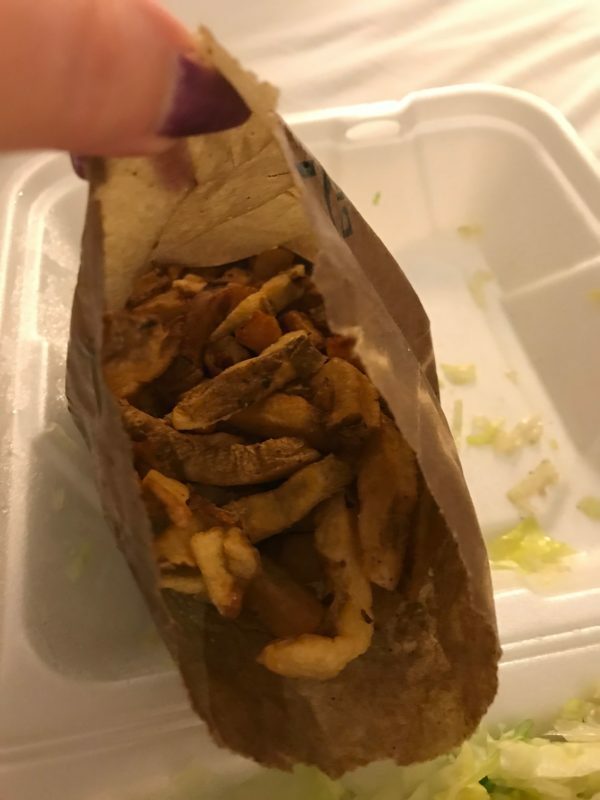 Who doesn’t want a bag of fries? Chicago’s pulled pork is pretty good. On our last day in Chicago, we had some time to kill before heading to their airport. If you read part two of the Starrcast/ ALL IN recap, you’ll know that I tried searching for options at Midway Airport. Unfortunately, there were no options for Nikki. We consulted Uber Eats again. 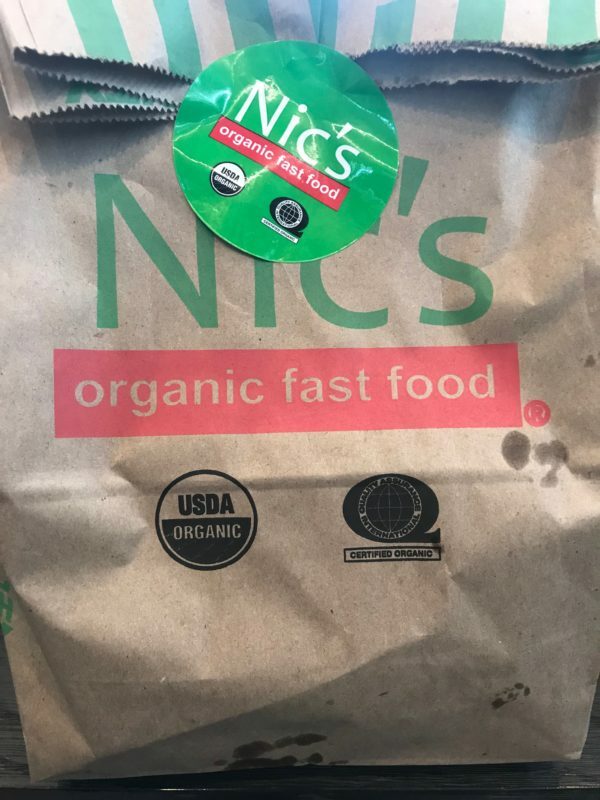 Nic’s Organic Fast Food was an option that we had considered on Friday night, so we decided to give them a try. Their motto is “Classic food fast favorites with a conscience.” Their food contains no antibiotics, added hormones, GMOs, artificial dyes or colors, preservatives, synthetic herbicides or pesticides, or ionizing radiation. Nic’s is also USDA Organic Certified and Quality Assurance International Certified Organic. Nic’s offers breakfast, lunch, dinner, and desserts. Along with various burgers, veggie burgers, vegan burgers, and lettuce buns are also offered. The menu also has grilled chicken sandwiches and chicken nuggets. 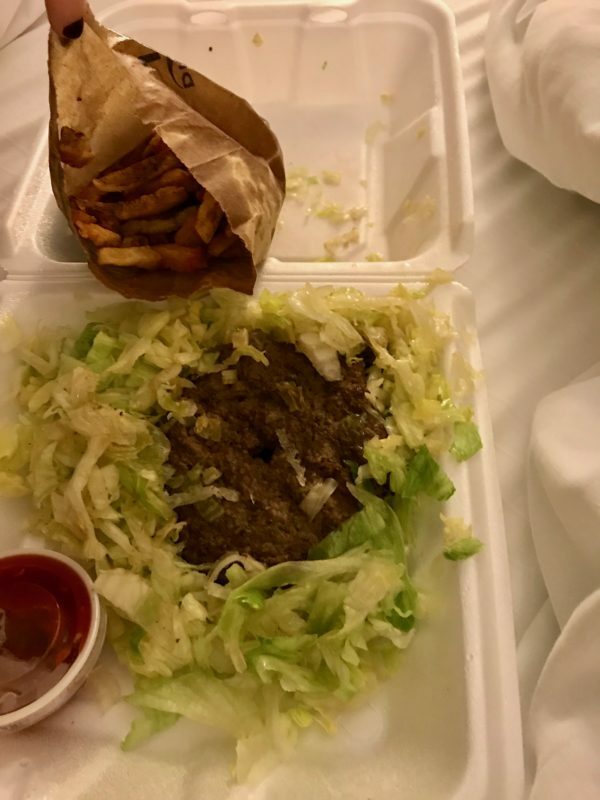 Nikki chose the hamburger with a lettuce bun (they had an actual lettuce bun, not a bed of shredded lettuce) since the gluten-free bun contains soy. She got the medium combo with fries and a drink. I went with the cheeseburger, organic root beer, and fries. Upon getting our food, Nikki noticed little pieces of cheese on the burger. It appeared as they began to cook it with cheese before realizing it wasn’t supposed to have cheese. Nikki had to pick it off, but she knows it was just a mistake. I did let them know when I left the feedback on UberEats (I still gave them a good rating). 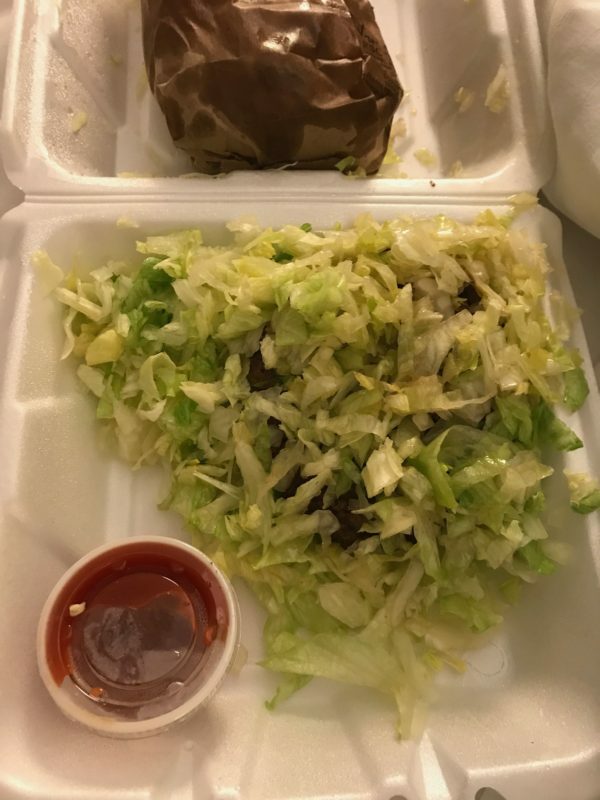 This is what a lettuce bun typically looks like. We need tea with sugar in it. We both really liked the food from both establishments. We both commented that we wished that Nic’s burgers were a little bigger. If you have dietary restrictions in Chicago, we recommend both places. If you liked these recommendations, you might also like Chick-fil-A, Wahlburgers, Chili’s, and Texas Roadhouse. As always, sharing is caring. Don’t miss any updates by following GFS on social media using the buttons below. What? WHAT?! How can this even be possible! I am so excited about this. I love the flavor of fast food. There’s just something about it that you can’t beat. The idea that I could have it and NOT kill myself slowly is so amazing! Right?! I hope more places like these open up around the country. I think a lot of people would love places like this. i’ll have to keep my eye out if I find myself in Chicago. These look like great recommendations! Great tips for travelers! Thank you for sharing. OMG you’re my hero! I’ve had to be gluten free for three years, and traveling always gives me anxiety because I envision days upon days of nothing but lettuce – LOL. Always good to know places I can check out! LOL my sister was concerned she’d be stuck with fruit & lettuce. I like sharing places that we find to help take some of the work out for others. I’m glad you can find some helpful info here! This is sooooo great! I’m cutting out gluten due to some digestive issues so this will help me so much. I used to have to eat gluten free. This would have been great for the diet I had! I would love to see more places like this pop up to give people with dietary restrictions more options. Great list! I’ll keep these bookmarked for my next Chicago visit! I’m glad to hear that. Please let me know if you eat at either place! I think the more places like this, the better it is, especially when traveling. It’s not always easy to find good options like this. I love that there are so many gluten-free options now it makes it easier to go through life with gluten allergies and sensitivities. These dishes are making me so hungry, they all look so delicious, and have my mouth watering. lol. I’m ready for a burger now. LOL reading all these comments is making me hungry too. Ok, so now I am hungry and craving those fries. I love places that serve great and healthy food. The fries were so good! I do too. One thing I can say, Hawaii and fast food might not be in the same sentence as organic fast food any time soon! We are however starting to get a lot of really great organic and vegan restaurants in the up and coming areas of the city which is very exciting! I will keep my eyes open for something this convenient and conscientious of dietary restrictions! That’s really great that more organic and vegan restaurants are opening up. The more options for people, the better. I usually visit Chicago each year, and never eat healthy! It’s fun, but I’m not used to it, living in Italy where we always eat fresh! 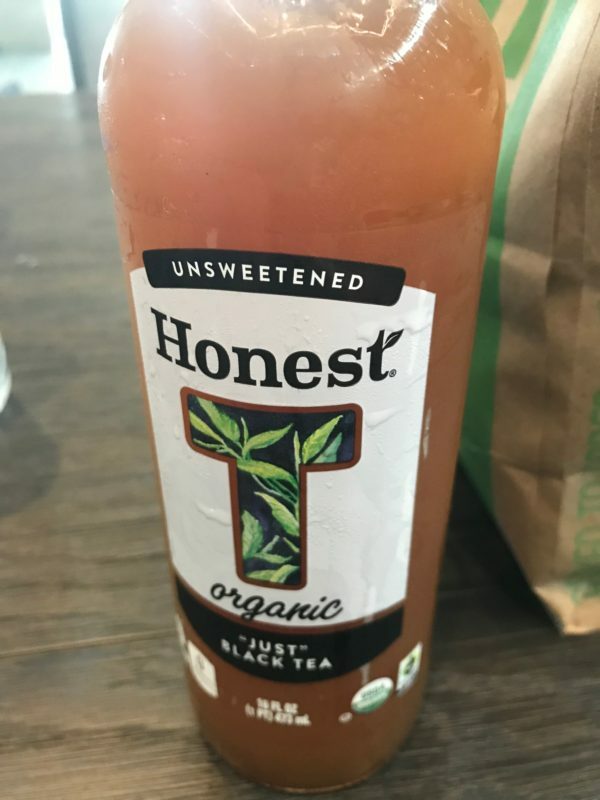 I like Nic’s Organic; this sounds so tasty! Eating fresh food in Italy sounds amazing! I really hope places like Nic’s Organic become more common across the US. Wow, such a detailed post that would be so helpful to plan a great trip to Chicago. Loving the pictures so much. Makes me hungry, just looking at the photos :). Being a vegan can’t taste most of them though. Nice to know there are diet conscious fast food available, now. 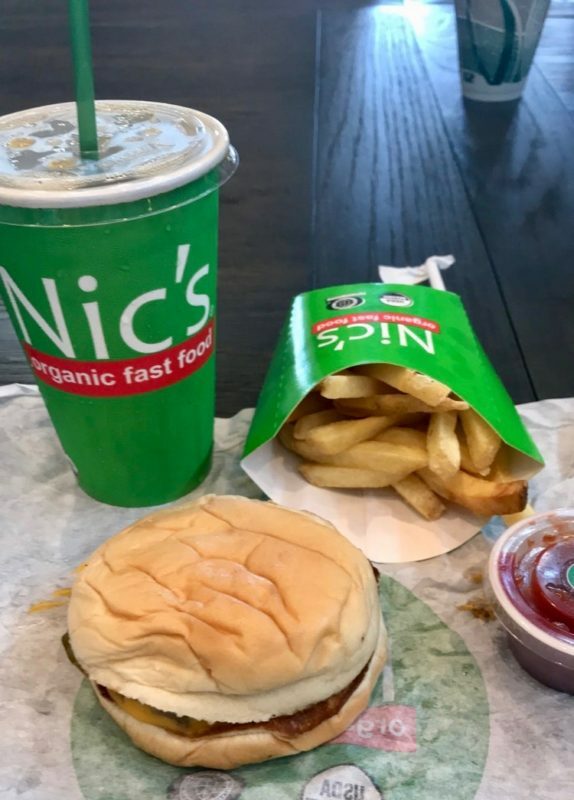 I believe that Nic’s has vegan options as well. Hopefully diet conscious fast food places become more common. This post has peaked my appetite! I hope we begin seeing more healthier versions of fast food joints pop up across the country– it’s definitely the right time for them seeing as so many people are so health conscious now. I’m limited to about one or two tried and true spots no matter where I go. I agree! People want healthy options and sometimes when you’re on the go, you don’t have many choices.